Office desk furniture is not the place to be cheap and casual. Your desk says a great deal about you. What does a big office desk say about the person behind it? They’re important! They’re kind of a big deal! Don’t settle for anything less than the desk that you deserve. The last thing you want is for your clients or coworkers to get the impression that you’re as insubstantial as your office furniture! Just because you’re working from home, doesn’t mean that you don’t deserve the best home office desk you can find. When choosing your desk, it’s best to think of the long term. A simple office desk might do the trick for now, but if you’re planning to put it to the same extended use that you would in a traditional office, you’ll need to invest in something more substantial. Make sure that you have a good idea of the dimensions of your room and the amount of furniture you’re going to require. For example, a big office desk is a must have, but what about filing cabinets? A credenza? A drafting board or computer station? Home offices are notoriously small so be sure that you can accommodate what you need before spending your money. What Desk is Right For You! Who doesn’t want a large office desk? What a symbol of power! However, symbols change as our society does, and these days people are moving away from traditional designs to more progressive, healthy designs. A standing office desk is an excellent solution for those looking for a healthier way to spend their working day. Excellent for the metabolism and entire body in general, a home office standing desk not only saves you space but helps reduce the negative impact of being sedentary for eight hours. Not into a high gloss power desk? A minimalist office desk may be more your thing. Easily coordinated with other pieces, these sleek designs are ideally suited to future forward offices where function is more important than ‘feel’. 1StopBedrooms – Your Secret Source for Office Furniture Deals! Go ahead and rush off to the latest office depot desks sale. Not only will you be plagued by high-pressure salespeople, but when it comes to dragging it up the stairs and setting up, you’ll be on your own. Your choice of styles is limited and the price? Don’t get started. 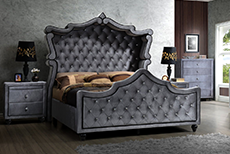 1StopBedrooms offers you a stress-free, comprehensive furniture shopping experience at the best possible prices. We’ll deliver your new desk and even set it up for you. With our warranty and secure financing, you’re closer than ever to the kind of home office you’ve always imagined!